From left to right: Top- Griffin Shoemaker, St. Anselm lacrosse commit; Eric Rauker, Stonehill football commit; Will Buraczynski, Merrimack soccer commit. Bottom- Shannon Riordan, Drexel soccer commit; Kayla Nixon, Assumption soccer commit. Littleton has come to be known as one of the best small-school athletic departments in the state and, despite a student body of less than 500 kids, the Tigers annually compete for titles in numerous sports, most recently capturing a state football championship in 2013. That success has carried over to the recruiting trail, as five Tigers signed National Letters of Intent to continue their athletic and academic careers at the college level Wednesday. 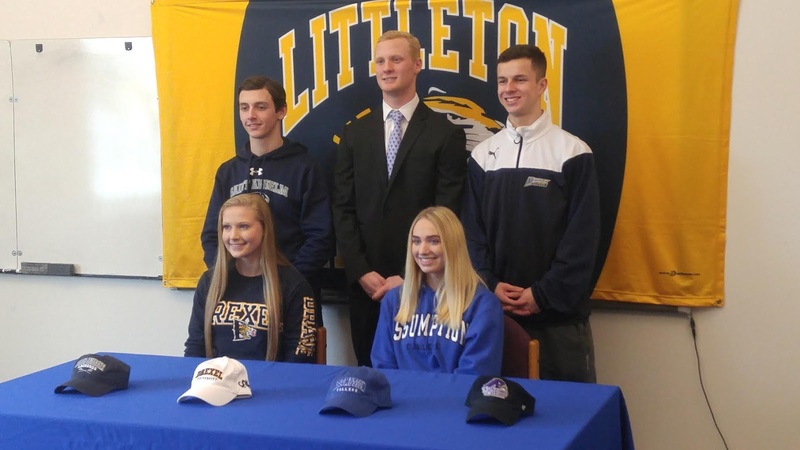 Three Littleton soccer players signed- Boys left back Will Buraczynski (Merrimack), and girls forward Kayla Nixon (Assumption) and defender Shannon Riordan (Drexel). The Tigers also saw linebacker Eric Rauker sign with Stonehill for football, and attackman Griffin Shoemaker pledge to play lacrosse for St. Anselm. It was a busy day, but each of the Littleton stars seems ready for the next step. "I was just looking all across the East Coast, and Drexel happened to be in the CAA (Colonial Athletic Association), which is a great conference," Riordan said. "I love the location, in the middle of the city (of Philadelphia), a new city that I haven't explore yet." "I love the campus atmosphere," Nixon said of Assumption's Worcester campus. "It's close to home, so I can come home, but I also love the team's desire to always get better and do the best they can." "The school is really building itself up," Buraczynski said of Merrimack. "I want to go into biology, and they've really impressed me there." Riordan, Nixon and Buraczynski can now fully prepare themselves for college soccer, as their high school careers are done, but Shoemaker still has another year of high school lacrosse ahead of him. "It's nice to head into the season without any recruiting stuff to worry about," Shoemaker said. "The coaches at St. Anselm kind of sold me on it, and I've got a friend, (Shrewsbury attackman) Matty Ward going with me, so I'm really excited." Rauker, who played the majority of his final football season with an injured shoulder, will unfortunately be unable to finish out his high school lacrosse career. Also a stellar goalie, Rauker will have shoulder surgery tomorrow that will put him on the shelf for a half-year or more. "It was tough to play with (the shoulder injury) last year, but I just had to fight through it," Rauker said. "There would be times were it would pop out, and I'd just have to stick it back in and deal with it, but I wouldn't trade (my senior year) in for anything." While the town and school are small, Littleton has made a big impact in Massachusetts high school sports lately, and these five athletes will no doubt help to increase the school's profile. Stay tuned to SuiteSports for continuing coverage of National Signing Day.